Indian airline industry has been growing at a consistent pace. The domestic passenger traffic is doubling almost every five years. It has grown from 2.3 crore passengers in 2005 to 5.1 crore in 2010 and now it stands at nearly 10 crore in 2016. According to Centre for Asia Pacific Aviation (CAPA) data, this makes India the third largest domestic air market in the world. The organisation also predicted that the domestic air traffic will cross 13 crore in the current financial year. However, the question is, are Indian airlines capable of handling the surging traffic efficiently? 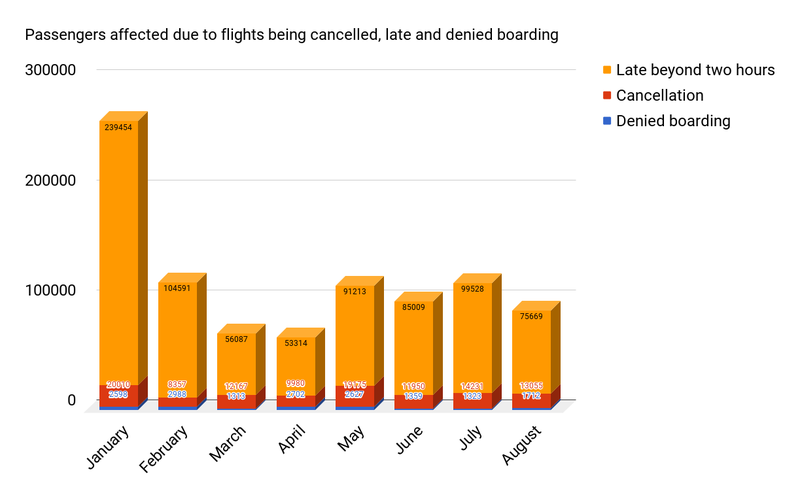 If we look at data released by Directorate General of Civil Aviation (DGCA) for the year 2017 (until August), one-fourth of all the flights ran late and almost 5 percent of the flights got cancelled. In the first eight months for which data is available, nearly 10 lakh passengers have been affected as airlines have denied boarding, cancelled flights or flights were delayed by more than two hours. About 24 percent of the flights run by Indian domestic carriers are never on time. 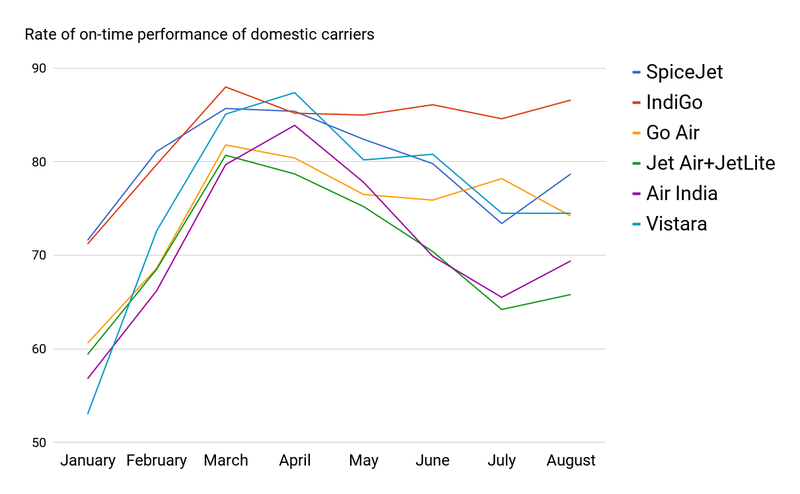 Almost all the major airlines performed more or less the same. The best on-time performance has been of IndiGo with a rate of 83 percent. The worst among the major airlines is Jet Airways (data includes JetLite’s performance) with only 70 percent of the flights being on time. Air India follows Jet Airways with an on-time rate of 71 percent. Among the first eight months, the worst was January with only 62 percent of the flights being on time, expectedly, as flights get delayed due to low visibility especially on North Indian airports. Interestingly, the data will look even worse at the year-end with winters yet to come. The overall number will take further dive as in coming months airports will face same, age-old problem—dense fog. By now, only three airports in the country—Delhi, Jaipur and Lucknow—have CAT-IIIB level instrument landing system (ILS Category-IIIB). This means that these airports can handle aircrafts landing with less than 50-metre visibility, at least theoretically. However, most pilots flying on domestic routes are not trained to land with this system. Airlines avoid the training as it is expensive, costing Rs 10 lakh per pilot. Passengers are not only marred by late flights but cancellation and boarding being denied due to various reasons also create problems for lakhs of passengers. In the first eight months, almost 10 lakh passengers were affected due to these reasons. Over 16,600 passengers were denied boarding by airlines operating in the country. Among the major airlines, Jet Airways, with 14,104 passengers, denied the maximum number of passengers to board the aircraft. Whereas, Air India and SpiceJet denied 2,054 and 293 passengers, respectively. IndiGo denied just three passengers as per submitted data. Close to 1.1 lakh passengers were affected due to flights getting cancelled. Passengers of IndiGo, which has the largest market share among domestic carriers, were the most affected lot because of cancellations. 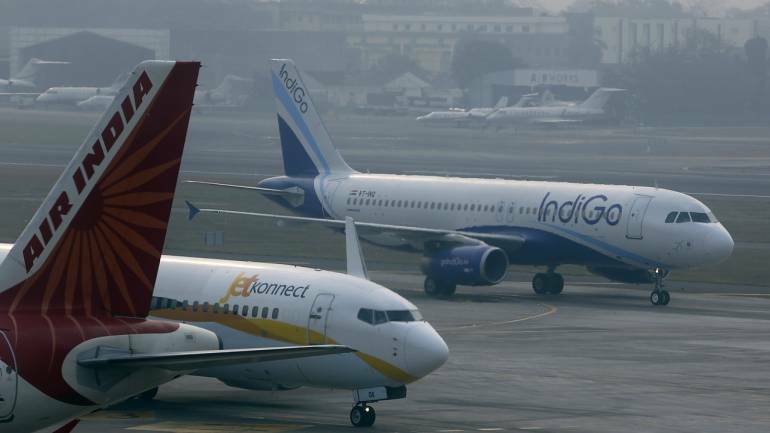 Nearly 43,000 IndiGo passengers suffered, whereas, for SpiceJet and Air India, the numbers were 2,609 passengers and 21,538 passengers, respectively. Interestingly, flights getting cancelled is not seasonal as it would be expected. Except in April and February, each month, the number of affected passengers was more than 10,000; January topping with 20,010 passengers. A whopping 8 lakh passengers were affected in first eight months due to flights being late by more than two hours. IndiGo and Air India topped the chart with accounting for more than 2.5 lakh affected passengers each. No surprises here as January and February were two of the worst months of massive delays being reported. The inefficiency in services not just affects passengers but also air carriers. They not only lose credibility but also have to pay a hefty amount as compensation and towards providing facilities to affected passengers. In first eight months, airlines have already spent Rs 34 crore towards compensation and facilities. Carriers paid Rs 22.7 crore to compensate the passengers which were denied boarding, translating into an average of Rs 13.66 thousand per passenger. Airlines also incurred expenses of Rs 4.15 crore towards facilities and compensation for passengers whose flights got cancelled and Rs 7.13 crore towards passengers whose flights got delayed by more than two hours. It is high-time, the air carriers along with authorities running the industry in India start working towards providing better services or else passengers, as well as airlines, will keep bleeding money and, more importantly, time.